How do you get more people to find your website? You have heard about the importance of SEO for your studio website. But did you have the time to figure out what exactly SEO is and how you can implement it? When I talk to Pilates business owners many of them have heard about the term “SEO” and they know that it’s an important thing. But very few actually understand what SEO is and how it works. Do the questions below sound familiar to you? If these questions have been running through your mind then it is time to focus on the SEO strategy for your website. In fact, one of the worst mistakes that you can make as a business owner would be putting money and/or time into designing a website and then think that customers will start pouring through your doors. resources to help you find the most important SEO ranking factors to focus on right away. What are Trigger Points? Simply speaking they are tight knots in the muscles that hurt when you touch them. Trigger Points are a result of contractions that can not release in microscopic muscle units – sarcomeres. This muscle “congestion” points limit blood flow in the tissue and can refer pain or numbness to other areas of the body. Trigger Points are present in virtually anyone especially in some of the most used and abused muscles of the body: back muscles, trapezius, hamstrings, quads etc. They can be aggravated by an injury, overuse during exercise, habitual poor posture and repetitive daily tasks. These tight knots can be painful (or refer pain to a different location) but even more often they will cause tightness and weakness in the nearby area. Knowing the location and release techniques for most common Trigger Points is an utterly useful tool for any Pilates Professional. While most of the Pilates teachers are familiar with foam rolling, Trigger Point Release using simple tools (small massage balls or even tennis balls) is far more effective in releasing tightness and helping clients reach their fitness goals. Prenatal Pilates is a topic that consistently stays popular. Pregnancy is a wonderful time in the life of a woman but it often raises a lot of questions and red flags for movement specialists. When should we stop doing Pilates? How late in the pregnancy can a woman start a new movement modality? How can we deal with pregnancy discomforts? And when can a woman safely return to her Pilates practice? Today we are talking to Leah Stewart about Pilates programming for pre/postnatal clients. Leah first started teaching prenatal teacher training courses as a faculty member of BASI. In 2015 she made a decision to take her teaching courses online and she launched her first interactive online course Prenatal Pilates Doula Program. In this interview we will talk about the building blocks of creating a well-balanced prenatal Pilates program and will address most common teacher concerns about teaching prenatal clients. Advice for the expecting mothers on how to stay calm. How Pilates teachers can provide support for their clients during pregnancy. Beneficial breathing patterns during different stages of pregnancy. How to create a well-balanced prenatal Pilates program for a client. When is it too late during pregnancy to start a Pilates program? What are the benefits of taking a prenatal teacher training course online? 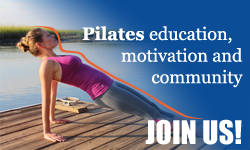 Would you like to have the flexibility of setting your own work hours, working from home and doing what you are passionate about – teaching Pilates? Then you have probably considered setting up a complete Pilates studio … right in your house. This guide was created to answer all of your questions on how to set up, market and run a Pilates home studio. It includes 90 pages of practical materials including best tips on how to find clients, protect your business legally and make more money teaching. A Complete Guide to Teaching Pilates from Home with PROFIT is not just the experience of one person, it combines advice of 12 experienced Pilates teachers. Some of them have transitioned from renting a commercial space to being home studio owners, some got tired of working at other studios for nothing, and yet others just fell straight into the home studio ownership. While most of the teachers interviewed are located in the US we also have several home studio owners from the UK and Canada who shared country-specific advice. Basically, we have every possible scenario that you can imagine and all the necessary resources for you to succeed. Home Studio Setup – how to choose your space and equipment. Where to find good deals on Pilates equipment. Essential Business Setup – Legal and Liability questions. How to Price your Pilates sessions. What you should (and should NOT! )spend your money on. How to MAKE more MONEY without teaching more. Proven Marketing Strategies to Grow Your Business. How to get Your First Client. How to establish successful studio policies. How to handle last minute cancellations. How to raise your rates without offending your clients. How to keep your Pilates Edge when working from home. Essential strategies for a work/life balance. Attachments to use for your business: Liability Waiver, Studio Policies, Client Screening Form.